Santa Ana, CA., August 1, 2018 – Silex Technology America, Inc., a global leader in wired and wireless networking solutions, today introduced its newest embedded Wi-Fi module, the SX-PCEAC2. It is a dual-band 802.11a/b/g/n/ac plus Bluetooth module supporting two spatial streams based on Qualcomm Atheros QCA6174 radio. It also supports Wave 2 MU-MIMO delivering enterprise-grade, dual-band 802.11ac Wi-Fi connectivity with link rates as high as 867Mbps. The SX-PCEAC2 is designed for high performance, media rich mobile device, mission critical industrial applications, medical devices and more. As one of a select few of Qualcomm Authorized Design Centers, Silex provides leading wireless technology with unmatched support around the world. We have certified the SX-PCEAC2 for FCC/IC, CE, and TELEC to reduce testing costs for our OEM customers. We provide driver support for operating systems such as Linux, Windows and Android. Our reference platform for driver evaluation and development is the NXP’s iMX 8 EVK platform. To further expedite the product development process, Silex also provides additional engineering services including custom driver development, certification services and hardware schematic design reviews. SX-PCEAC2 is a 802.11ac WLAN plus Bluetooth combo solution that supports 2x2 MU-MIMO with two spatial streams for designed to deliver superior WLAN and BT performance. 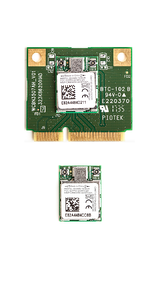 SX-PCEAC2 s available in both surface mount (M.2 LGA Type) and half mini PCIe form factors. The SX-PCEAC2 supports WPA and WPA2 including 802.1x Extensible Authentication Protocol (EAP) types. It provides robust security for enterprise demands. As Qualcomm’s Authorized Deisgn Center, we have direct access to their design information that enables us to provide premium hardware and software support from design through deployment. Modular certifications and approvals available for FCC (USA), IC (Canada), ETSI (Europe), MIC (Japan). The product is in full production and is now available for purchase at our distribution partners. Contact Arrow Electronics to order now. Click here to learn how to start your evaluation.